With Bono, the Edge, Adam Clayton & Larry Mullen, Jr.
It’s clear from the opening strains of the U2 song Vertigo, performed live from River Plate Stadium in Buenos Aires, that you are in for something cinematically explosive. Trust me when I say that the technology used in this very special concert film, shot in digital 3D, is like nothing you’ve encountered in your years of either movie watching or concert-going. To go one step further, the film is simply better than most live concerts I’ve been to. As cliché as it might sound, you really do feel like you are in the first few rows, both from a visual stand point as well as an aural one. And as anyone who has been to a live concert knows, especially of the arena or stadium variety, being in the first 10 rows is a completely different experience than sitting anywhere else. The natural energy between performer and audience member happens within that realm. 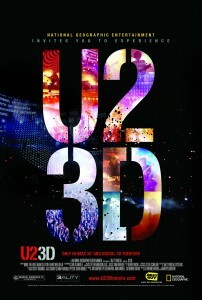 Watching “U2 3D” you have that same visceral experience. No more cheap seats for this reviewer! 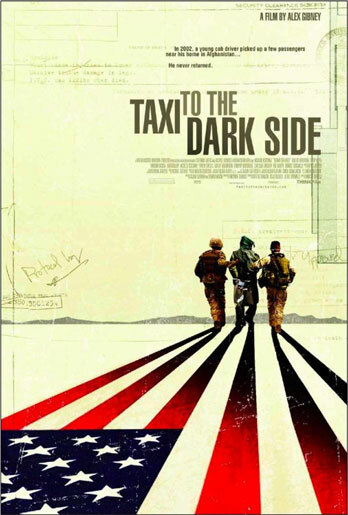 Friday marked the New York City premiere of Alex Gibney’s Oscar-nominated documentary, “Taxi to the Dark Side”, the rather grim story of a young Afghani goat herder and taxi driver named Dilawar who is mistakenly suspected of being a terrorist by our military intelligence. Brought into Bagram for interrogation, Dilawar is subsequently tortured and killed by his interrogators. The ThinkFilm release gets to the darker truths, namely that not only is the intelligence questionable in the first place but that the interrogators were, in fact, young soldiers utterly untrained and inexperienced in the ways of proper interrogation techniques. Matters are made worse when the soldiers are encouraged by their superiors to go to any lengths to get their confessions. In addition to the now prosecuted soldiers, among the interview subjects are New York Times journalists, various academics, politicians, former military brass and, most notably, Gibney’s own father who died during post-production. Frank Gibney, himself a former interrogator during World War II, best expresses the sense of outrage with the Bush Administration and as images of Bush, Cheney, Rumsefeld and Gonzalez flash across the screen it’s hard not to squirm in your seat by your own sense of frustration. There doesn’t seem to be any level of success when it comes to the administration’s war on terrorism, itself an unforgivable reminder of those who perished on 9/11. Gibney, who also directed the award-winning “Enron: The Smartest Guys in the Room”, recently met with journalists and described the challenges and rewards of making “Taxi to the Dark Side”. Here are a few of clips from that interview. Videos of a round table interview with Director Alex Gibney for his new documentary Taxi to the Dark Side. Just how botched the current administration’s tactics have been in its war on terrorism is made abundantly clear in Alex Gibney’s absorbing new film. 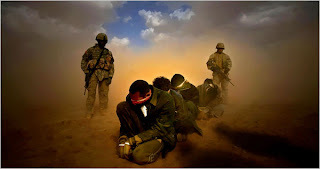 This documentary is one of many detailing the quagmire that we have found ourselves in both legal and moral terms, not only in Iraq but also in Afghanistan. What’s new is that “Taxi to the Dark Side” gives due attention to an otherwise overlooked victim, a young Afghan taxi driver who is taken in for questioning and dies a few days later at the hands of his captors. In his prior documentary, “Enron: The Smartest Guys in the Room”, Gibney lucidly walked his audience through a complex web of business and legal issues to get to the greedy core of what inevitably brought down the titular power company. Here, Gibney is no less successful with a subject that is much darker and disturbing. Besides the story of the taxi driver, Dilawar, his mistaken capture, torture, and subsequent death in the hands of U.S. military intelligence, Taxi also broadens the more sinister story of a government willing to do anything to cover up its mistakes. The irony is that the same incompetent culprits that caused Dilawar’s death were also incapable of hiding their crime. And while Dilawar’s story sometimes feels lost in the scheme of things, the film’s interviews with his family members are heartbreaking and effective.